Over at Prairie Homemaker, we've been talking about salvaged wood: where to find it and what to do with it. I thought I'd share a photo of a trestle table I made from the top of an abandoned motorcycle shipping crate. 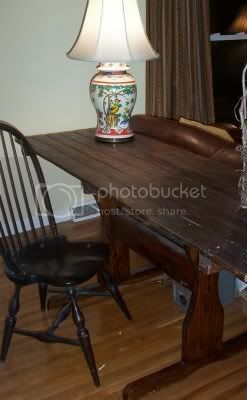 Our last home had a long, skinny dining room, and I wanted an equally long country table. It had to be skinny, so the room wouldn't look crowded, and no store-bought table fit the bill. You wouldn't believe how hard I hit the brakes when I saw a 7 foot long pallet leaned against the side of a motorcycle shop! My mom bravely asked for permission to take it home. You know guys: they looked at us like we were nuts, as did my neighbors when I dragged it into the yard. The wood was typical pallet pine: rough, splintery, yellow, and knotty. I stained it a dark brown and applied so many coats of my favorite British Briwax , I lost count. Gradually the top developed a patina and the wax smoothed the splinters. This photo doesn't show enough detail, but its rough cut saw marks, nail holes and knots gave it an old English cast. I salvaged the base from another junked table, wiped it with stain, and screwed it on. With black Windsor chairs down its 7' length, the table made the room look like Country Living. Unfortunately, the next house demanded a round table. I simply lopped off the ends and placed the table behind the sofa. This is where I can write letters and make notes while we watch movies at night. Who knew a pallet could be so useful? Wow! I am throughly impressed! That looks great! pretty table! I posted to your mommy meltdown entry too! Beautiful! My gosh, from a junky crate to beautiful furniture! I am often astounded by your frugal gifts. I wish you lived near me.